Although it’s still the iPad and, to some extent Samsung’s Galaxy lineup of tablets that grab the headlines, the future looks brightest for good value 10-inch tablets. The Google Nexus is perhaps the front runner for now, but Acer’s Iconia A210 – a 10.1-inch tablet recently upgraded and now running an updated Android 4.1 Jelly Bean OS – is a great value effort that deserves a second look. As well as some half-decent speakers, the A210 comes with a very handy USB slot – something that will make life very easy for those who download a lot of video. Who needs complicated cloud-based apps and home networking antics when a USB slot will do the same jobs faster and more reliably? Shipping with 16GB of storage (an 8GB version is also available), the A210 also has a microSD card slot – though it’s hidden from view – and a 1280 x 800 pixel resolution IPS LCD screen that’s just hi-res enough to show HD footage. Still, with even seven-inch tablets like the Google Nexus 7 and Samsung Galaxy Tab 2 7.0 having the same resolution despite being many times smaller in terms of screen real estate, that must be judged poor value. The A210 is all about creating a 10-inch tablet at a good price, and although that inevitably means some corners have been cut, these are fewer than we’d expected. 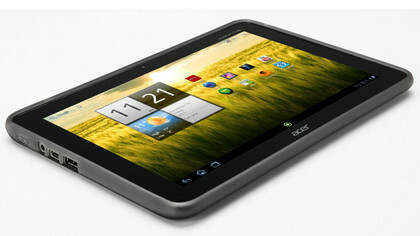 Hardware-wise the A210 measures 159 x 175 x 12.4mm and weighs 659g. Two small speakers are mounted – oddly, perhaps – on the back of the A210, a soft-touch plastic that’s hardly high-end but offers more grip than it looks like it should. The strongly curved corners help too, and while the 18mm black screen surround is larger than we’d like, it does help add to the perceived contrast of video. The rush to have tablets and smartphones with super-slim bezels does seem to forget that. 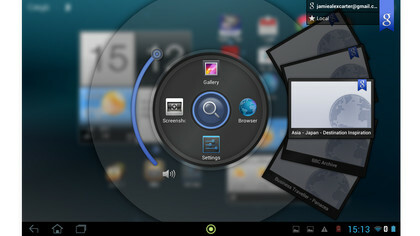 The top left-hand corner has an Iconia Tab logo, with the main Acer logo at the bottom of the screen. 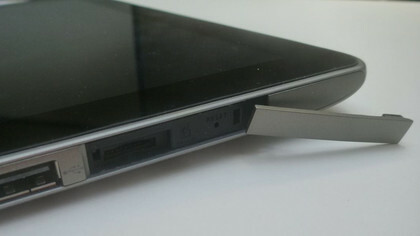 While this lowest edge of the product is otherwise clean, the left-hand side houses that USB 2.0 slot, a microUSB slot (there’s also a cable in the box), a headphones jack, a standby switch, and a covered area that shields a microSD slot (that can take maximum 32GB microSDHC cards) and a reset button. On the top of the screen is the volume rocker, an orientation lock button and the A210’s mono microphone. On the right-hand side is the last remaining input, for power, though we’d like to have seen this removed in favour of charging via microUSB – that way, we could take one fewer cable when travelling with the A210. Worse, the power cable supplied is less than a metre in length. The lack of an HDMI output on the A210 will also deter catch-up TV addicts from plumping for the A210; others won’t miss it at all. 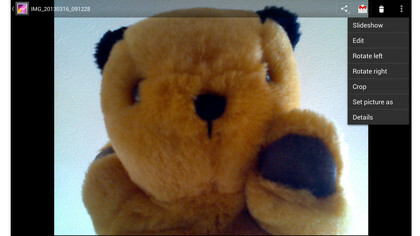 Though there is a basic VGA webcam on the front of the A210. Some will bemoan the lack of a camera on the rear. Personally, we’d dismiss that criticism as misunderstanding what a tablet is for: the beauty of the genre is that they can have myriad uses, of course, but photography is surely not one of them. For those looking for a tablet with no extraneous nonsense onboard, the lack of a camera is a stroke of genius. Perhaps another is the reasonably low resolution. The A210 gets nowhere near the Retina stakes, mustering just a 1280 x 800 pixel resolution, though that’s just enough to host 720p natively. The A210 has a decent quad core 1.2GHz processor based on a Nvidia Tegra 3 T30 chipset, has 1GB RAM and includes both WiFi and Bluetooth, as well as GPS. While the interface is regular Jelly Bean, the A210 does have a layer of – for once – genuinely useful Acer-made apps and ideas. 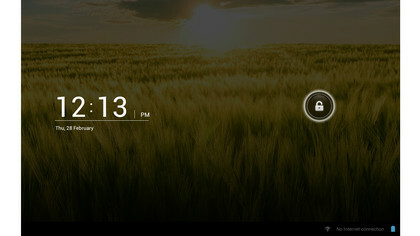 The most noticeable is the lock screen, which features the usual swipe-to-unlock gesture. However, as you swipe to the right, four shortcuts – in this case to Gmail, Browser, Gallery and Google – appear as four segments of half a circle. Our only issue is that you have to double-back while swiping to choose one of them, but in practice it works fine. There’s also the Acer Ring, a four-pronged dial that pops up over whatever screen you’re looking at when you press the yellow ‘ring’ in the centre of the screen’s lower edge. When activated, the transparent ring makes the background blurry, and presents four shortcuts to whatever you want (by default they link to Gallery, Browser, Screenshot and Settings) around a Search shortcut, with a volume control on one side and links to recently visited web pages on the others, as preview-style tabs. 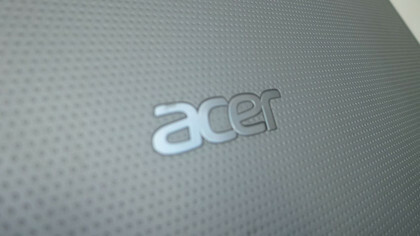 Acer Ring is well executed, useful and nicely designed. The A210’s IPS LCD panel is just sensitive enough for general navigation, and is also absolutely fine for watching video. The viewing angle is good, colours are reasonable (there’s the usual lack of contrast, but that’s LCD for you) and certainly detailed enough for everyday viewing. Any lower res, mind, and we would have serious reservations – it’s right on the limit. The A210’s reasonably fast processor also ensures that apps are launched quickly and multi-tasking is a breeze – in ten days of testing we only had one freeze-up and very few delays. Since we use a lot of Google-made services – including Gmail – and the A210 is an Android device, we immediately visited the Google Play store to download the Chrome browser. However, the A210 comes with the vanilla Android browser, which is almost as good – though we don’t pretend to understand why it still exists. The latter boasts almost as good integration, with a sign-in and automatic loading-up of bookmarks, though it is possible to set the navigational bar to swap search engine from Google to Ask Jeeves, Yahoo! or, err, Bing. In use the A210 does the job, zipping between websites using either browser, and allowing backflips, new tabs ad infinitum and video – both SD and HD – load-ups and playback without any complaints. After inserting a portable hard drive or USB thumb drive into that USB 2.0 slot, the A210 does nothing, though fire up the Files shortcut (dragged onto the Home page from the main collection of apps and widgets) and that USB device is waiting to be explored. In our tests we managed to get a host of video files to play, including high quality MKV files alongside the likes of MPEG-4 and DivX, AVI, MOV, WMV, AVC HD and even WMV HD, though not AVC HD. Part of Acer’s clear.fi suite of software on the A210 is Video, a nicely designed, impressively simple widget with an Apple-esque faux-wooden look to its shortcut icon. It presents all video files as still thumbnails, along with a total time count at the bottom, though the only way to tell if a file’s format is not supported is if it gives a duration reading of 00:00 (somehow the thumbnail image still appears). 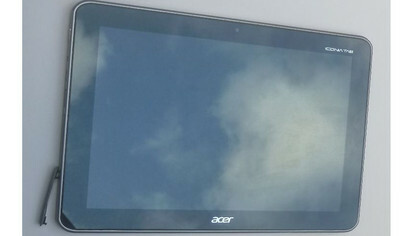 Videos can be presented as either collections (Acer-speak for the folders you’ve created) or just as one grid-like display of everything the A210 can find on the tablet. 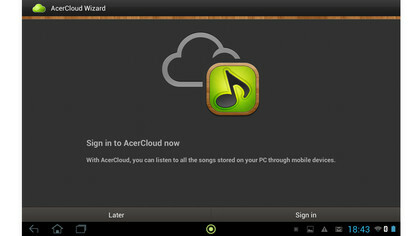 Pick any music file – including MP3, M4A, WMA and even lossless formats like FLAC and OGG (though not APE nor AIFF) – and the A210 can play these either through the native Android software (now simply called Play Music) or 7digital, a music player that’s also a commercial download app. If you want to use the clear.fi version – Music – it must be launched from the Home page, though it’s the best-looking and most comprehensive of the entire clear.fi suite. As well as picking-up digital art and song titles, everything’s ordered into albums, artists, playlist and genres, and presented against a simple metallic weave. Sound quality is surprisingly good. A blast of classical, Jupiter from Holst’s The Planets, sounds thin and somewhat harsh, but some acoustic music sounds bright, with just enough low frequency to compete. It doesn’t go to extremely high volumes, but those volumes are distortion-free and can be controlled both on-screen in the Music app, and on the volume rocker on top of the device. Could the A210 do a job as an emergency hi-fi in a hotel room while on hols or a business trip? It certainly could – and it’s far better than most smart phones and laptops – though, as always, it’s through headphones that sound is at its best. It’s this way we’d recommend using the A210 as a video device, though the speakers cope well with dialogue-heavy fare. Photos, meanwhile, use JPEG, PNG and GIF formats (TIF files aren’t supported, which might annoy photographers), and again Acer offers its own software, entitled merely Photo. Once opened, photos can be shared via Bluetooth, Picasa, Google+, Gmail and via downloaded apps like Evernote, though oddly, not Dropbox. Books can come from myriad sources, with Google Play Books, Kobo (ebooks) and Zinio (magazines) apps included by default. The A210 comes loaded with apps, and not just the previously mentioned Acer-made clear.fi suite; Netflix, Acetrax (movie rental), Aupeo (web radio), 7digital (music), and Google-owned apps like Gmail, YouTube and Google Maps all integrate well by default. 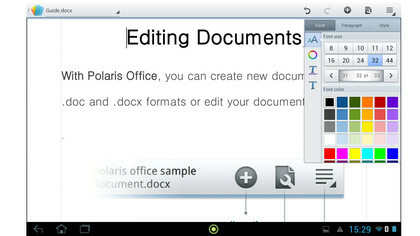 Infraware’s Polaris Office app – worth £8.99 – is included for free, which is handy for editing documents from MS Office, though there are many others available on the Play Store. Such software, however, brings a new dimension to the A210’s USB 2.0 slot, since a desktop keyboard can be wired-up (though Bluetooth is also present). There’s also an AcerCloud option for file-sharing and back-up, though it’s probably wiser to rely on a cross-gadget service from Dropbox or similar. The Home screen includes an overly large "Life Digital Weather" display which is supposed to mimic what’s going on outside, but in our tests it displayed raging sunshine even at night – and only changed if the tiny "update" icon was pressed, which is a tad high maintenance. There’s also a separate widget that gives you information by activity or "lifestyle", but we were never able to see exactly what the next five days held in store for dog-walkers, hikers or kite-flyers as the icons (15 in total) proved inactive. Stats for rain, UV, temperature and wind remained whatever activity we selected. It proves adequate for gaming, with sessions of Shadowgun: Deadzone, Cubeman and Real Football 2013 looking and feeling smooth, and gameplay free from disrupting stutters or streaks. Various games are pre-installed on the A210, including Fantasy Town, Let’s Golf, Air Attack and Fruit Ninja. All are dealt with well, and the A210’s six-axis gyroscope makes tip ‘n’ turn games easy to work with. This is one of the A210’s potential weak points, as it completely lacks a rear-facing camera. 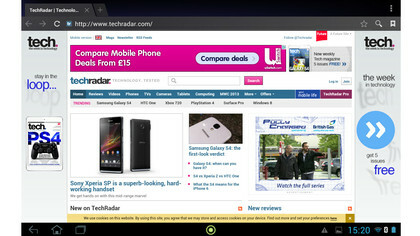 But we don’t rate that as a particular problem – tablet photography in public is a worrying trend and it needs to stop! The only time you would need a camera is for making Skype video calls, but the supplied optics are pretty poor. The webcam in question is just two megapixels and situated in the usual place – centre, top – and can film in either VGA or 720p HD quality. There are also options for white balance presets (daylight, cloudy, incandescent etc), time-lapse filming, and a plethora of silly face effects and backgrounds ("in space", sunset etc). That webcam also makes a stab at stills, though we’re not sure why. Within the standard Android offering there are options to tweak the exposure and white balance. 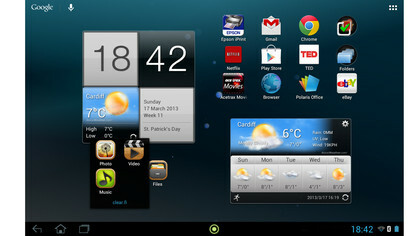 Images can be cropped, rotated, flipped and set as the desktop background from the vanilla Android Gallery software. 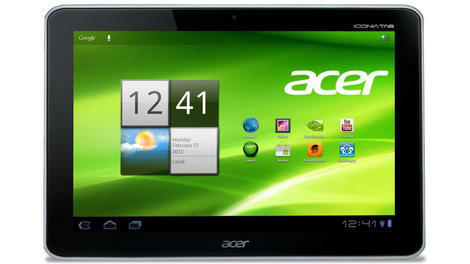 This is probably the major area where the A210 doesn’t compare well with its biggest rival the Samsung Galaxy Tab 2 10.1. Saddled with a 3260mAh battery that’s about half as clever as Samsung’s 7,000mAh battery, the A210 managed only six hours of video. 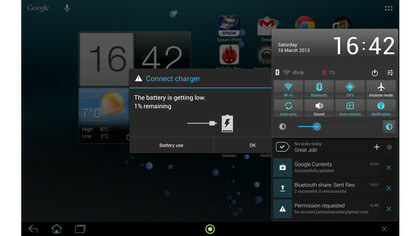 Indeed, our 90-minute Nyan Cat test forced the A210’s battery down from fully charged to just 81 per cent. Mind you, that’s a tad better than the Google Nexus 10. Still, we do like the option to easily de-activate certain features, and the pop-up taskbar gives options to turn off the likes of Wi-Fi, Bluetooth, GPS and Notifications – or just engage Airplane mode – with single presses. Fully charged, we were able to use the A210 intermittently through the day to browse and check email without too much of a worry about its battery, though by late afternoon it needed some power – and sadly its proprietary cable is very short, ruling out any browsing while charging. 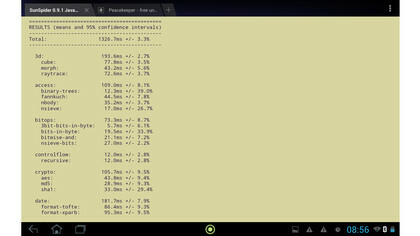 In our SunSpider benchmark test of the default Android browser (and, indirectly, of the processor, too), the A10 scored an average of 1302.7ms – that’s significantly above average for a budget Android tablet – while the browser earned a pretty average score of 443 from the Peacekeeper browser test. Qualcomm’s Vellamo app-based browser test for HTML 5 and all’round ‘metal’ produced a score of 1,384 and 356 respectively, which ranked the A210 in fifth place behind a few Android smart phones, but above the Sony Tablet S and Samsung Galaxy Tab 8.9. It might be built to meet a price, but we found the A210 solid and much more rugged than most, and with a mottled back that’s soft and easy to grip. Its design is somewhat uninspiring, but the A210 stacks up pretty well against the competition: it’s got enough processing power, touchscreen sensitivity and even built-in audio to compete with higher-priced 10-inch tablets. 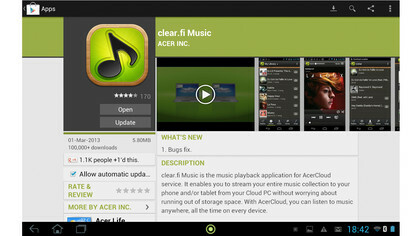 That NVIDIA Tegra 3 processor does its job well, though kudos to Acer for its splendid Acer Ring shortcut screen and swish suite of clear.fi apps. However, most of our love is reserved for the A210’s USB 2.0 slot, which makes sharing and transferring files from other devices a doddle. We also liked how the A210’s useful microSD slot is nicely hidden, as a specific digital media card is almost always going to be inserted permanently, and not swapped very often. There’s no rear-facing camera, no HDMI output, the pixel density of such a big screen is almost archaic, and the general look and feel is rather industrial. We were also slightly alarmed by the decision to supply the A210 with not just a proprietary power cable/charger (instead of just relying on the already included microUSB slot), but a short one at that. That oversight is made more serious by the A210’s relatively short battery life. 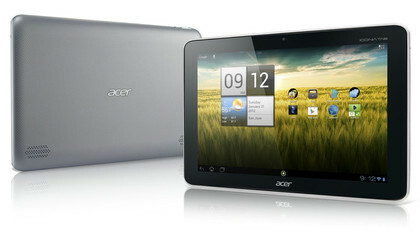 The Acer Iconia A210 is one of the best budget 10-inch tablets available. If it wasn’t for the very average battery life, we’d be having a major fling with the A210 because it has both flexibility and an Acer-made polish to its user interface that we really enjoyed using. Granted, it’s all about functionality and value, not flashy features and design. It’s almost a third thicker than the iPad, though uses that girth well; the inclusion of a USB 2.0 slot makes casual file-swapping easy while also allowing keyboards to be wired-up. We can’t tell you how much we love it for that USB slot, but there’s more to like with useful Android Jelly Bean mods like Acer Ring and some simple, home-baked apps that give a nice un-Android feel to playing music, videos and photos. In theory, the biggest issue is probably its screen, with those 1280 x 800 pixels getting nowhere near an iPad 4, but that’s not the A210’s market and, in any case, video playback is nevertheless impressive. Some will also bemoan the lack of rear camera and, more understandably, the no-show of an HDMI output. Judged against the Google Nexus 10, the A210 comes out well, with its lower price and expandable options (USB 2.0 & microSD) giving it the leg-up, while battery life is about equal, though again it loses out on screen resolution. 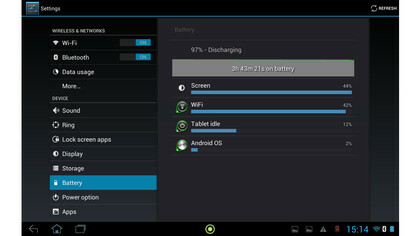 Where it differs most from its other main rival, the almost identically priced Samsung Galaxy Tab 2 10.1, is on battery life; its rival boasts a much larger battery, though in real life usage the difference is minimal. And that’s the A210 in a nutshell. On paper it’s the poor relation to a lot of its rivals, but there’s everything here that the average tablet user needs – and in terms of value for money, it’s hard to beat.